Nine in ten people are at risk of developing the Basal Cell Carcinoma (BCC), -the most common cancer type in humans, notably because of their age and exposure to the sun’s ultra violet (UV) rays. A recent research study by geneticists of the University of Geneva sheds light on the way that this cancer type starts. 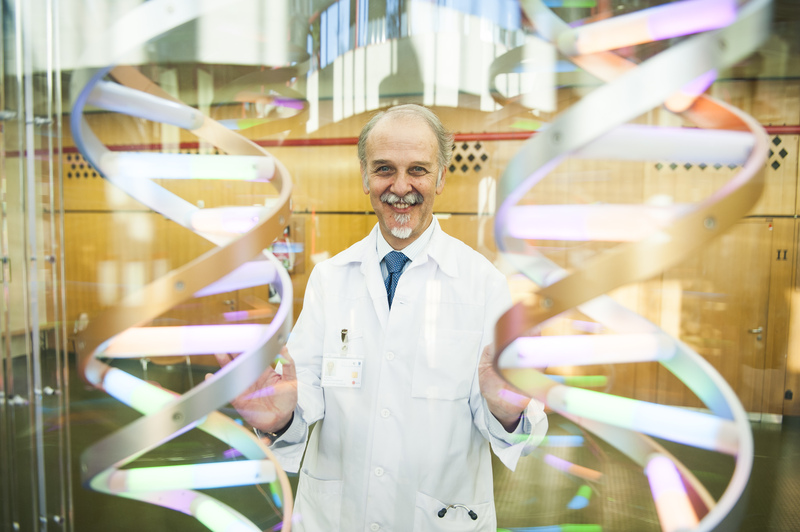 Stylianos E. Antonarakis, Professor at the Department of Genetic Medicine and Development, University of Geneva Medical School and one of the authors of this analysis talks about its findings as well as about the latest news of the ongoing research on Down syndrome. Mr Antonarakis, in which way is our knowledge enlightened through this analysis? In the last fifteen years we understood that all cancers are genomic disorders. In other words the cancer cell has a genome that is abnormal. It has mutations and rearrangements. We categorize the whole field of cancer as genomic disorders of certain cells in the body. So, we have also understood that cancer is due to sequential mutations in different genes. The cell lineage starts with a mutation in one gene, then another mutation in another gene and progressively the cell becomes malignant. Thus when we study the genome of the different cancers we try to identify which genes are mutated in order for the cell to become cancerous. We call these genes driver genes. About 7-8 years ago there was a mega-project in the US, Canada and Europe to identify the driver genes for all cancers. But there was one cancer that was not studied and that was the basal cell carcinoma. The carcinoma of the skin. We became interested in studying it because through our life time and through our sun exposure this particular cancer accumulates a lot of mutations more than any other cancer including melanoma. That was the first really cancer project in our laboratory. Why were we interested in identifying the cancer genes? First to make a diagnosis of the exact DNA lesions and DNA problems in the cancer that we study. Second, to find out if there are there any drugs that we can use that act against the driver mutations either on the DNA or on the protein. The third goal is to identify why a cancer relapses after treatment and to find the new moleculardefects in order to plan the second generation drugs. The fourth is to monitor the natural history of that cancer to see if the mutation disappears or reappears in those cancers. In the same analysis the genes MYCN, PRPN14 and LATS1 are identified as additional drivers for the development of basal cell carcinoma (bcc). Which were the steps that lead to this discovery? With the basal cell carcinoma, we knew that there is one metabolic pathway that is abnormal. We knew that this was an important step but that did not explain the heterogeneity of the tumors, and the differential response to treatment. So during this study we found additional or new cancer genes -the three that you mentioned. In order to do this we took approximately 300 tumors, we read their genomes, and the genome of the blood from the same individuals, compared the two, identified what was new in the cancer cell and then using a sophisticated statistical analysis, we came to the conclusion that these three genes and some others are likely to be the additional cancer genes in that particular cancer. Given the fact that each tumor has its own particularities, a personalized treatment for each patient is needed. Does this apply to all cancer types? That is a very important question and a fundamental notion in modern medicine. Most cancers have their own genetic constitution. They vary from each other. So, it is wise and important to read the genome of each cancer and adjust the therapy and all the measures that we take for this cancer to the particular personal profile of that particular cancer genome. We call this personalized cancer medicine or as I like to call it genomic cancer medicine. In the future I predict that the DNA of every cancer and every metastasis will be sequenced and with this knowledge the treatment of cancer will be personalized and revolutionized. But we are not there yet. For some cancers we know the driver genes and the drugs against them, but for the majority for others we do not. Which are the latest news about the molecular mechanism that causes Down syndrome? The research to understand the trisomy 21 or Down syndrome and all the other chromosome aneuploidies is ongoing. We still know very little but with what we know, we now have a better understanding of the mechanisms for the development of the different symptoms. In trisomy 21 there are 3 chromosomes 21. But we do not know exactly why three copies of a gene gives you a disorder. Our lab and others provided a new mechanistic explanations for this. The other new thing in Down syndrome is that now with the neuroscience, the neurophysiology and the research in the brain, -not in the human brains but in mouse brains with trisomy 21, we are beginning to understand some basic differences between the neurochemistry of the Down syndrome brain and that of the normal brain. And there we have a hope that we can use drugs to revert or to retard the intellectual disability that these people develop. When I went to medical school it was unthinkable to consider a drug treatment for trisomy 21. Now years later we all have hope that some drugs that change the level of excitation in the brain may help in treating the intellectual disability of trisomy 21. The third thing is that we are very close in understanding why there some children with Down syndrome develop a heart defect, and why other develop leukemia and early onset of Alzheimer’s disease. You understand that trisomy 21 and the Down syndrome provides a very good model to understand other common disorders. And the fourth thing that happened recently is the non-invasive prenatal testing in which we take blood from the pregnant woman and we can see if there is a circulating fetal DNA in that and from that circulating DNA we can identify the trisomy 21 pregnancy. That has dramatically changed the prenatal screening. What are the most important issues facing human genetics research nowadays? The biggest challenge is to collect large numbers of samples. The second one is that the cost of sequencing is still high for large studies; therefore the technology to sequence and the computational capacity need to evolve. The third -which is very difficult, is to accurate determination of the signs and symptoms of each individual. That sounds easy but it is very difficult because it is expensive to go out in the population and record in a scientific hierarchical way all the signs and symptoms of one’s individual’s lifetime. So the phenotypic assessment as we call it is as important and as expensive as the genotypic assessment, the reading of the genome. And there is one more challenge: to manipulate the genome in order to understand what mutations mean and how we can treat them. For that, there was a recent tremendous development of the gene editing and that has become easier faster and cheaper. What is your desire about your research field? I would be extremely fulfilled in my scientific career and extremely happy if within my lifetime there would be a treatment of Down syndrome and treatment of the intellectual disability and some other signs and symptoms of the syndrome. I think that would be the epitome of my personal career that started before the knowledge of the sequence of the genome. I hope we will go all the way to the application of a treatment for this very common genomic disorder. And I am very scientifically optimistic that this will eventually come.